Here’s my pretty rad showcase at 35 Denton!!! Featuring Madison, WI psychedelic duo PEAKING LIGHTS,who blew people away in 2011 with their synthesizer and guitar LP 936 (not not fun). Philadelphia psychedelic-noise rock trio PURLING HISS have come through town in the past with Kurt Vile and in October with The War on Drugs. Midnite Society from Denton are on the bill too!! along with solo electronic artist Treasure Hunt who is usually accompanied with really offensive and entertaining visuals. Artwork designed and printed by illustrator James Heimer. 35 Denton & Parade of Flesh present . . .
Sunday, March 11th, 2012 – 9pm? Tickets on sale at 35 Denton.com Check out the insane lineup! 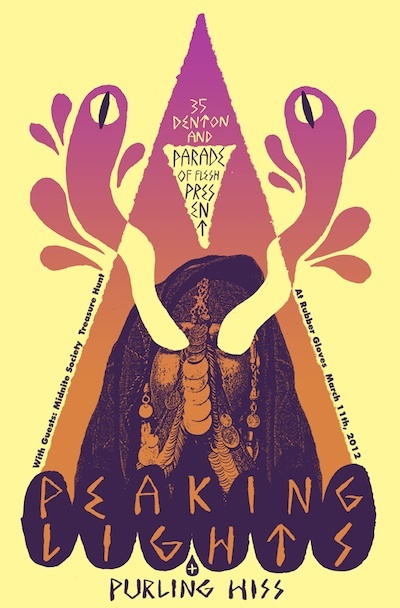 This entry was posted on February 14, 2012 at 10:00 am, filed under News and tagged 35 denton, 35d, denton, midnite society, peaking lights, purling hiss, rubber gloves, treasure hunt.